Five Star Real Estate Agent Award – Exclusive recognition of area real estate agents. 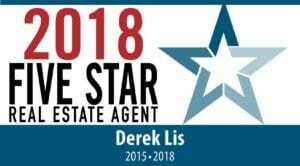 Denver, CO – Derek Lis, NeXstep Real Estate Group, is featured in a special section of September’s issue of 5280 magazine as a 2018 Five Star Real Estate Agent award winner. Five Star Professional partnered with 5280 magazine to identify and showcase an exclusive group of real estate agents who have demonstrated excellence in their field. Fewer than 4% of agents in the Denver-area received this recognition. “Thanks to my clients for your support and recognition as a Five Star Real Estate Agent. Building a business based on client referrals, I’m truly humbled by your support. You have been the driving force behind my ongoing success, from the mountain resorts to the Denver metro market. More to come in 2019!” Said Derek Lis of NeXstep Real Estate Group. The 2018 Five Star Real Estate Agent award winners have been carefully selected for their commitment to professional excellence and overall client satisfaction. The award is based on rigorous research with significant focus on customer feedback and providing quality services.“Five Star Professional’s research is extensive, with more than 10 million consumers, peers and other stakeholders contacted each year. We are relentless in our efforts to identify those professionals with the utmost standard of excellence,” Jonathan Wesser, Research Director, Five Star Professional. Derek Lis is a Colorado native who grew up in Fort Collins and attended the Colorado School of Mines where he played football and received a B.S. in Civil Engineering. In addition to being a licensed Real Estate Agent, he is also a Registered Professional Engineer in the State of Colorado. After college he went on to work as a civil engineer in Denver and worked on the redevelopment of the Union Station neighborhood. While working full-time, he decided to go back to school at The University of Denver where he received an M.S. in the Real Estate & Construction Management program. He then transitioned into real estate as his full time career, but is able to apply his expertise in land development engineering to provide value to prospective real estate clients. Derek is well versed in all aspects of real estate completing multiple transactions in residential, commercial, leasing, investment properties and even completed a ground up development of a mixed-use development. In addition to providing brokerage services, he actively invests and manages residential and commercial investment properties. He is working towards his CCIM (Certified Commercial Investment Member) designation. In his free time you can find him in the mountains, watching sports, or anywhere live music is being played. He resides in Denver with his wife and three daughters. Now entering its 15th year, Five Star Professional conducts in-depth, market-specific research in more than 45 markets across the United States and Canada to identify premium service professionals. Five Star Professional contacts thousands of recent homebuyers to identify award candidates. Phone, mail and online respondents rate their real estate agent on 10 satisfaction criteria. Candidates with a qualifying client satisfaction rating move on to be evaluated on objective criteria such as experience, production levels and disciplinary and complaint history. Real estate agents do not pay a fee to be considered or awarded. For more information, visit www.fivestarprofessional.com.